The Ekiti State House of Assembly on Tuesday banned former Deputy Speaker and Peoples Democratic Party member , Segun Adewumi ( Ekiti West Constituency 1 ) for six weeks for alleged undue interruption of the Speaker , Adeniran Alagbada . The suspension followed verbal exchange between the Speaker and the former deputy Speaker at the plenary , prompting the Speaker to exercise his powers with which he banned him in accordance with Section 17 of the House Standing Order . Following the suspension , the Speaker said Adewumi would be prevented from participating in any plenary session , but could only be involved in off-plenary activities of the House. Alagbada said: “ I am still the presiding officer of this House and it constitutes an infraction for any member to interrupt me when I preside, except you have an observation to make . Other lawmakers, in their submissions , agreed with the action , saying the Speaker did not circumvent the Constitution and standing order in arriving at the punitive measure against Adewumi . The Assembly, however , passed a bill to repeal Ekiti State Official Logo Amendment Law No . 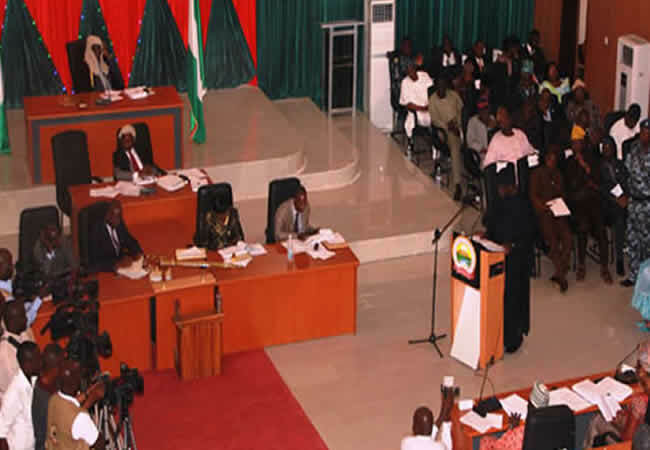 28 of 2014 ; while the bill to re-enact Ekiti State Government Official Logo Law 2011 was passed by the Assembly. The lawmakers also considered Ekiti State Development and Investment Promotion Agency Bill 2019 and fixed another legislative day for further legislative processes . However , the screening and confirmation of some political appointees earlier fixed for Tuesday was shifted on the request of the Executive.